Modern-day slavery – typically defined as any form of forced human exploitation, such as human trafficking and forced labour – is one of the most complex and distressing issues of our age. This multibillion-dollar industry is estimated to enslave millions of people in more than 150 countries across the world. Highlighting the gravity of the issue is a recent report – ‘Global estimates of modern slavery: forced labour and forced marriage’ – by the United Nation’s International Labour Organisation (ILO) and the Walk Free Foundation, which states that 24.9 million individuals were trapped in forced labour over the preceding 12 months, with children accounting for 10 million of this figure. Drilling down, of the 24.9 million victims of forced labour, 16 million were in the private economy, another 4.8 million were in forced sexual exploitation and 4.1 million were in forced labour imposed by state authorities. 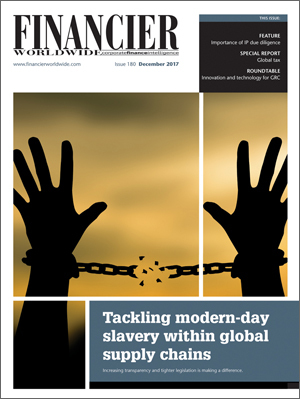 According to the Global Slavery Index, two-thirds of the victims of modern-day slavery are from the Indo-Pacific region (mainly within North Korea, Uzbekistan, Cambodia, India and Qatar), while several of these countries provide the low-cost labour that produces consumer goods for markets in Western Europe, Japan, North America and Australia. In terms of anti-slavery legislation, the Thomson Reuters Foundation notes that a number of initiatives and regulations have been introduced to raise awareness of modern-day slavery and implement clear supply-chain requirements – such as the US Trafficking Victims Protection Act of 2000, California’s Transparency in Supply Chains Act of 2010 (TISCA), the UK Modern Slavery Act of 2015 and the Trade Facilitation and Trade Enforcement Act of 2016. But many countries still lack regulations against child and forced labour. Throwing a further spotlight on the issue was the recent Bali Process Government and Business Forum in Australia, a high-profile gathering of global business tycoons and politicians from 48 countries. The forum, which Indonesian foreign minister Retno Marsudi said was all about “raising awareness of ethical business practices and accepting standards for good labour practices throughout the supply chain”, included the heads of US retail giant Wal-Mart Stores Inc, Japan’s Mitsui and China’s JD.com among its ranks. Analysing this lack of transparency is a recent CORE Coalition report – ‘Risk averse: Company reporting on raw material and sector-specific risks under the Transparency in Supply Chains clause in the UK Modern Slavery Act 2015’ (October 2017) – which looks at the statements of 50 companies; 25 of which source raw materials known to be linked to labour exploitation, such as cocoa from West Africa, mined gold, mica (a mineral used to create a shimmer in make-up) from India, palm oil from Indonesia and tea from Assam. The other 25 operate in sectors known to be at risk of modern slavery, including clothing and footwear, hotels, construction, football and service outsourcing. The report reveals that: (i) many high-profile cosmetic companies do not directly reference child labour in mica supply chains, despite there being an estimated 20,000 children working in hundreds of mica mines in Northeast India; (ii) leading chocolate companies withhold any specific reference to labour exploitation in their cocoa supply chains, although all source from West Africa where child labour and forced labour are endemic in cocoa production; and (iii) prominent jewellery firms fail to detail the risks of slavery and trafficking associated with gold mining (the ILO estimates that close to one million children work in mines worldwide). These company statements, which are recommended by the UK Home Office and collated by the Business and Human Rights Resource Centre on its Modern Slavery Registry, clearly illustrate that many major companies are not reporting on the risks of slavery and trafficking associated with specific commodities and sectors across global supply chains. Moreover, although as many as 11,000 companies are covered by the Modern Slavery Act reporting requirement, only around 3000 statements have been made to date. Pressure is clearly on companies to address the issue of slavery within their supply chains – a task made all the more difficult given that it is often unclear which working practices should be labelled with the term. Among the sources of pressure is the need to comply with rules and regulations requiring the identification and reduction of slavery in upstream production, watchdog groups with rating and ranking systems, shareholder activists and business competitors. While the complex nature of global supply chains can of course make it extremely difficult for companies to detect unacceptable labour practices, it is, nevertheless, those companies’ responsibility to be informed about risks in all parts of their business operations. Once conditions conducive to slavery are detected, companies with a mind to take action have a number of options at their disposal, including withdrawing from a ‘guilty’ jurisdiction or attempting to engage with suppliers directly to address the issue at its source. Numerous tools and methodologies enable companies to identify potential ethical, legal or environmental concerns in their supply chain. Furthermore, while appropriate international legislation would shut down a demand for slavery-produced products, without it, an ethical company must compete with those that are not similarly minded. So, companies that take voluntary action when they detect slavery in their global supply chains can be undermined if their end consumer lives in a region that does not explicitly restrict slavery. Ms Sheth also believes that withdrawing from affected supply chains does not help to remedy the situation and may only shift the problem elsewhere. “It should only ever be the last option, to be implemented in cases of continued denial of responsibility or failure to act proactively to protect children and adults from modern slavery practices.” Instead, she recommends that companies should engage in both self and second line monitoring, invite independent third-party auditing, and work with producers and operators to resolve harmful labour practices. Solutions for many of the world’s corporate ills are often sought through legislation, and in this respect modern-day slavery is no exception. Certainly, legislation in this arena is legion, with no shortage of extant rules and regulations. Mr Littenberg notes that the California and UK legislation has been very successful in sensitising companies to slavery risks in their business and supply chains – both having resulted in a large number of companies making enhancements to related compliance programmes. “Because these regulations are ‘disclosure only’ regulations, they provide companies with the flexibility to structure a thoughtful compliance programme that is tailored to their business, industry and specific supply chain risks,” he says. Some see the introduction of such legislation as merely representing the beginning of the fight against modern-day slavery. Moreover, there is an increasing appetite for companies to incorporate fundamental human rights criteria into their business planning documents, annual reports and procurement contracts, as well as voluntary action which denies unethical companies a market integrated with legislation. For many observers, modern-day slavery in global supply chains is a perpetual issue – a scourge with no real prospect of change. Yet while there are those that do not believe the issue will be resolved any time soon, if at all, others see better informed consumers and investors and the adoption of dedicated compliance programmes as the answer to the affliction. While modern-day slavery remains rife in certain sectors and no company can be sure its global supply chain is free of such abuse, increasing transparency and tighter legislation is making a difference. Heightened attention to these issues – and their potential impact on reputation and the bottom line – is turning the screw on businesses to the extent that it is no longer possible for them to look the other way when awkward questions about working practices start being asked.